The Wildtek Source 21w solar charger is one of the best pure solar chargers we have reviewed. It holds a 4.2 rating on Amazon, but comes highly recommended from various other sites. Let's find out why there is so much love around this device. The Wildtek Source 21W is a beast. The perfect combination between efficiency, portability, and durability. This device sizes at 6.6 x 12.4 x 2.2 inches and weighs in a 2.1 pounds. In addition, it can fold into a surprisingly small size, and open wide to allow for maximum access to the sun. This makes it easy to stuff in a backpack and take wherever you want. The power behind the Wildtek Source 21W is one of the best things about this product. The absence of a battery makes it purely a solar charger and not a power bank. When there is no battery present, you can expect that the solar panels are going to be crazy good. Most of the time in solar power banks, the solar capabilities are low and meant more for emergencies. Though there are some exceptions to that generalization. But back to the item at hand. Like the title states, it gives out 21 watts, which is crazy awesome. On a beautiful sunny day, it could charge your Galaxy smartphone is just under 3 hours. In addition, the device features dual USB ports, each putting out 2.4 amps with a max total of 3 amps. 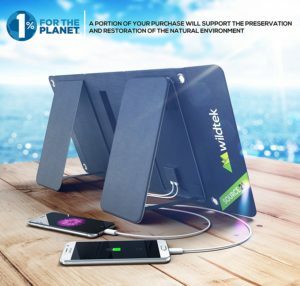 This solar charger also features Wildtek's exclusive SmartCharge technology, which is along the lines of other quick charge tech. It detects your device and alters the power output to give your device teh fastest charge possible. Since there is no battery, there is no power capacity. All of the power you get is generated by the solar panels. Speaking of which, the solar panels on the Wildtek Source 21W are a force to be reckoned with. They feature SunPower's latest technology and a 24% conversion rate to give you super fast and stable power. The solar panels are also made from PET, which is a super durable monocrystalline solar cell. These ultra high-efficient solar cells, along with the dual USB ports are all cased in a rugged polyester cover. Meaning, it can take a beating. The polyester is very durable against bumps, scrapes, as well as weather resistant. In addition, the solar cells are covered with a high-quality plastic. This helps to protect the solar cells from any damage that could come to them. Though the PET is already extremely durable on its own. The polyester casing also features stainless steel rings at each corner, so you can securely fasten it to your backpack while hiking. One of the shining features about this device is that it is the first truly waterproof device of its kind. The solar cells, case and even the USB charging ports have a waterproof rating of IP65. Silicon tabs can be inserted into the USB ports to protect them from any water, dust, or any other damage. In addition, the case also comes with a built-in stand that allows you to place the solar panels at either a 45 or 90 degree angle to get the best sun exposure and the most efficient charge. Wildtek has been around for a few years. They were first founded in Oakland, California in 2014. They specialize in phone cases, as well as portable power, such as the Wildtek Source 21W. Their mission is "to help you become more limitless, take your adventures further, and experience more flow and joy". This company is also a member of 1% for the Planet, which is an ecological movement. They donate a portion of their sales to ongoing preservation and restoration practices. The Wildtek Source 21W is one powerful solar charger. The solar panel conversion rate is 24%. Plus, like the name suggests, the solar panels give out 21 watts, which is awesome. The solar cells also use SunPower's latest technology which is capable of providing ultra high efficiency from a surprisingly small panel. Speaking about small, the whole device is rather small. It can be folded into a very compact size that can be easily fitted into your backpack. When it is unfolded, it can be attached to your backpack by the steel rings at the top corners. Not to mention it is very lightweight, weighing in at just over 2 pounds. Dual USB ports, each maxing out at 3 amps makes for fast and reliable charging. Also, if you buy an extra power bank, you can charge that and your phone at the same time. Completely waterproof and element proof. The whole device has a IP65 waterproof rating. So no matter where you go, you can rest assured that your solar charger can handle it. Not to mention the rugged polyester makes it very durable. The company is a member of 1% for the Planet, which donates a portion of its sales to conservation and preservation practices for the planet. While solar panels are very powerful, their efficiency can take a dive on overly cloudy days. Be sure to keep in abundant sunshine to get the most out of your solar charger. Larger devices may take a bit longer to charge. If you are fan of outdoor sports that involve you getting wet or dirty, than this is the solar charger for you. The Wildtek Source 21W will take good care of your electronics, while holding up to the elements, especially water. If you accidentally drop this thing in the water while you are white water rafting, no need to worry, it will come out working just as good as it did before. Can not say the same for your phone though. The Wildtek Source 21W is a lot of bang for your buck. It is completely waterproof and capable of charging your devices quick and easily. Not to mention the company actually cares about the environment, so that is a plus. Right now, you can find it on Amazon for $69.99. It is a little more expensive than some of the others we have reviewed, but it is definitely worth it. If you are still not sure about which solar charger to get, check out the rest of the reviews of our top 10 best portable solar chargers on Green and Growing. Here are some top questions that I found for people seriously considering buying the Wildtek Source 21W. How fast will it charge my Galaxy S8? For most small devices, it will take about 2 hours. given adequate sunlight availability. How many mAh is it? It puts out 4,200 mAh. Can this unit store solar energy? In fact, yes it can. If it has collected enough sunlight during the day, you can use that energy when there is no sun available.